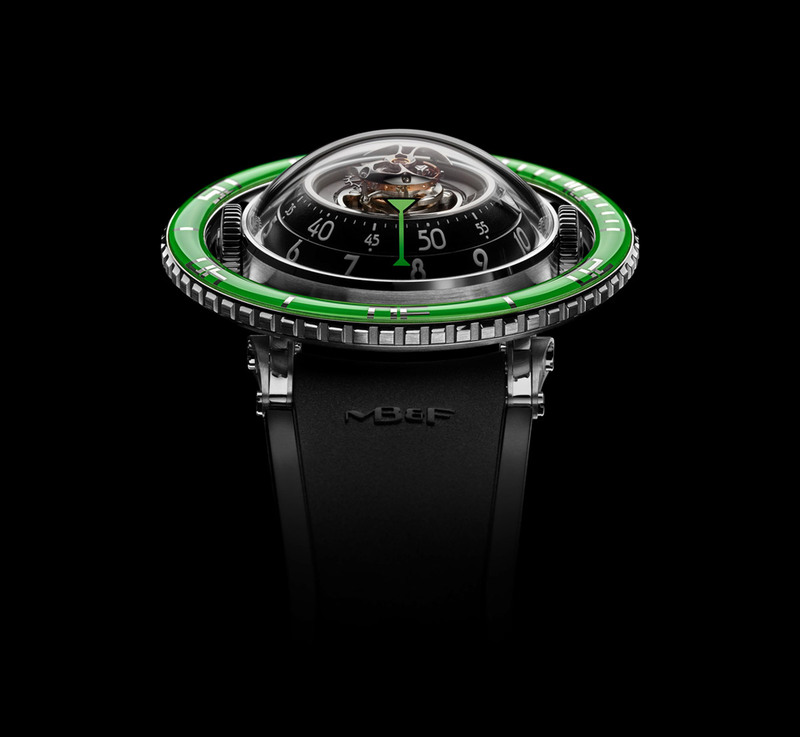 Following the 2017 version in red gold with black ceramic bezel and in titanium with blue ceramic bezel, MB&F is now launching a third variation in titanium with a green sapphire crystal bezel. 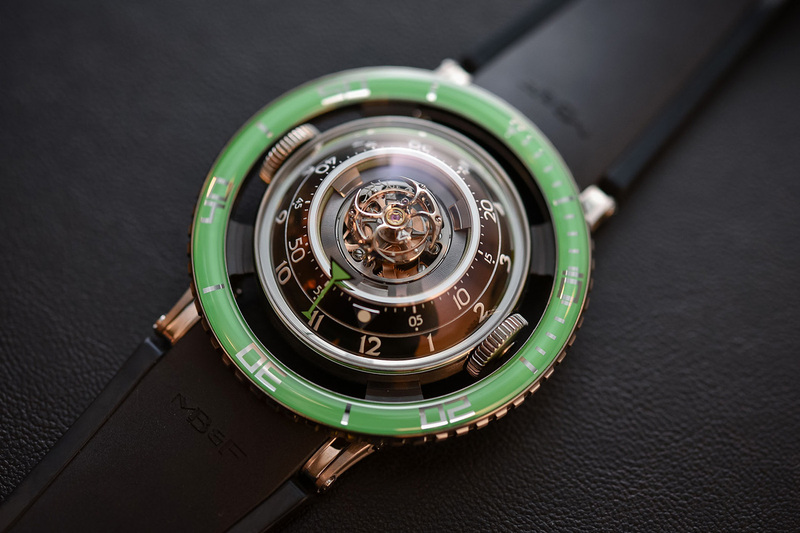 Inspired to the radially symmetric design of jellyfishes, the HM7 Aquapod Green has a concentric architecture with, from bottom to top, the winding rotor, mainspring barrel, hour and minute indications, and flying tourbillon, all of them arranged around the central axis. 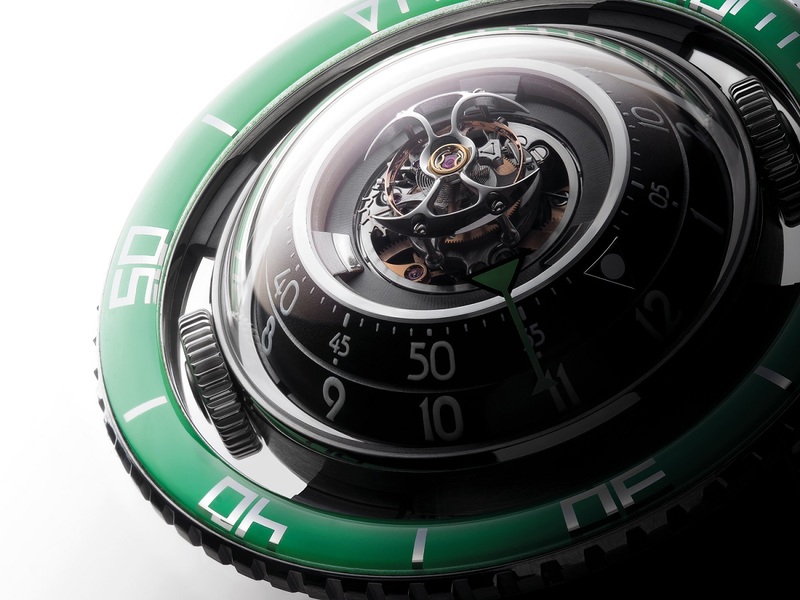 At the very top of the movement, the wearer can enjoy the continually rotating flying tourbillon regulator. 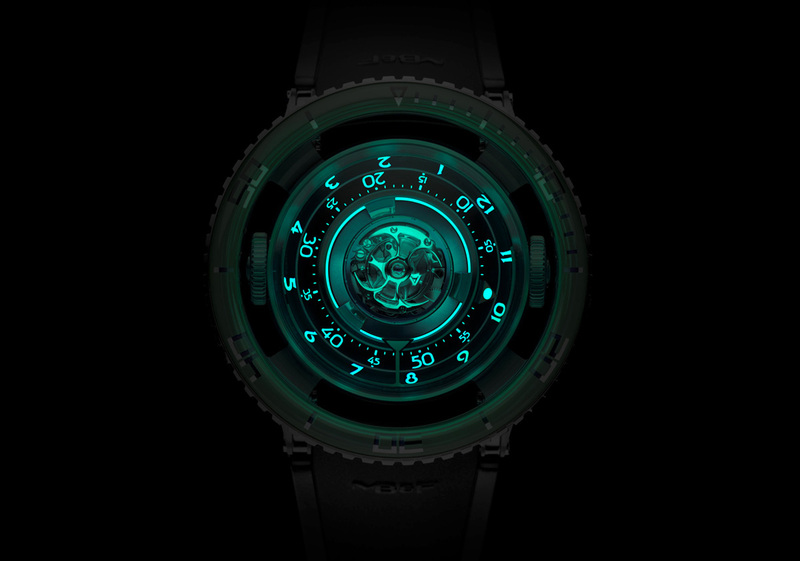 Three panels of AGT Ultra (Ambient Glow Technology) lume around the inside of the movement illuminate the tourbillon for maximum appreciation by night. 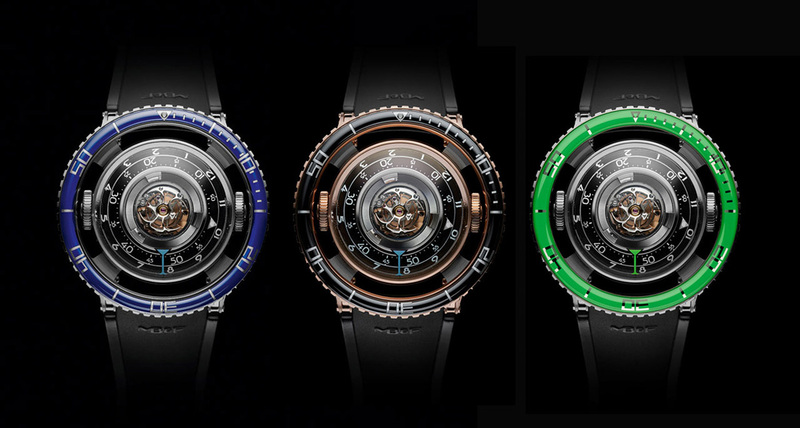 The curves of the high-domed sapphire crystal are mirrored in the shape of the time display rings, which are not simply flat and angled, but are mathematically precise, curved spherical segments. 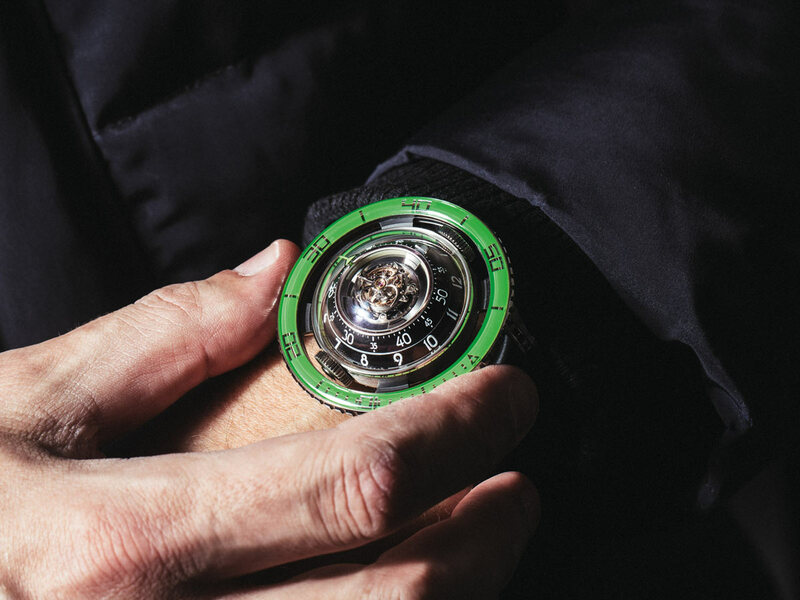 The hours and minutes are displayed around the periphery of the movement. 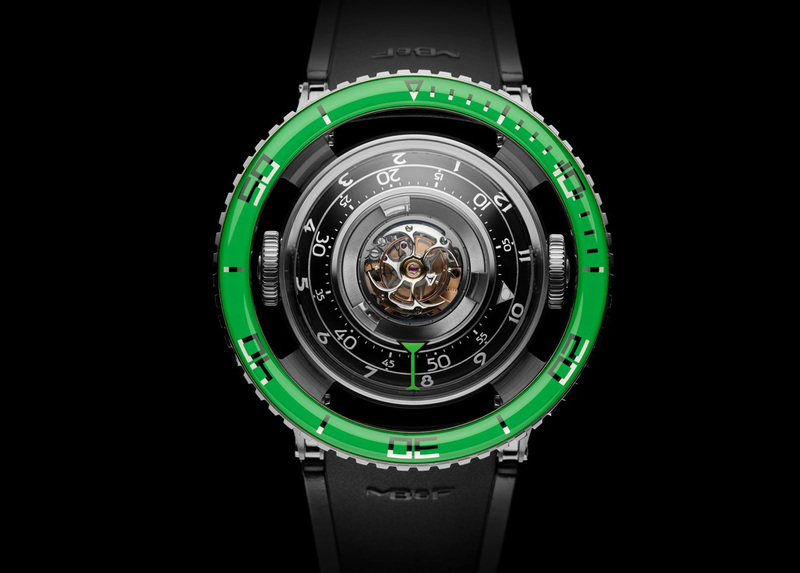 The two large time display rings are supported by ceramic ball bearings which optimize rotation thanks to a very low coefficient of friction. 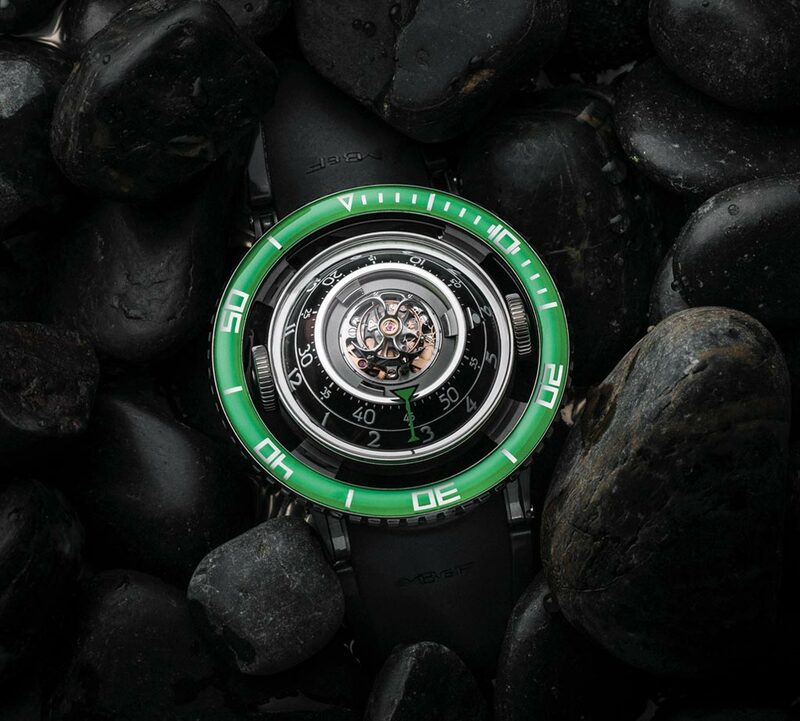 While the Horological Machine No.7 is not a dive watch, it is a timepiece that can be comfortably worn at the seaside as witnessed by its unidirectional rotating bezel which, unlike every other dive watch, isn’t attached to the case, but floats apart like a life buoy. 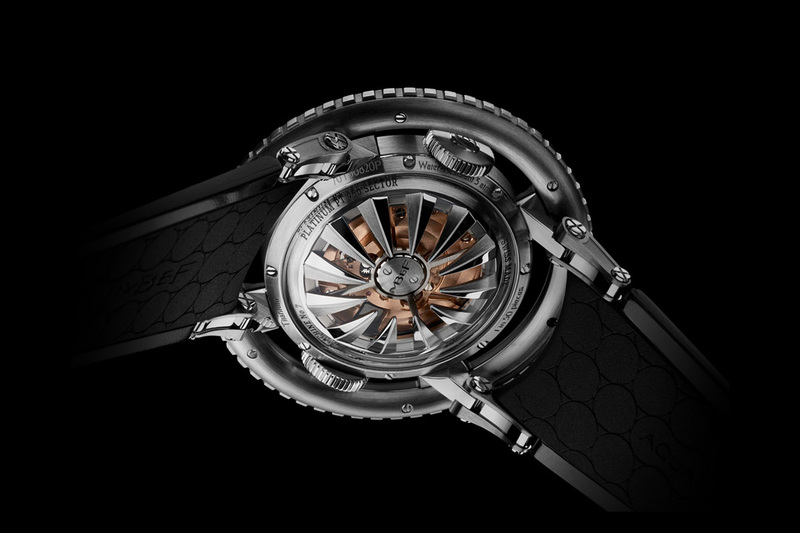 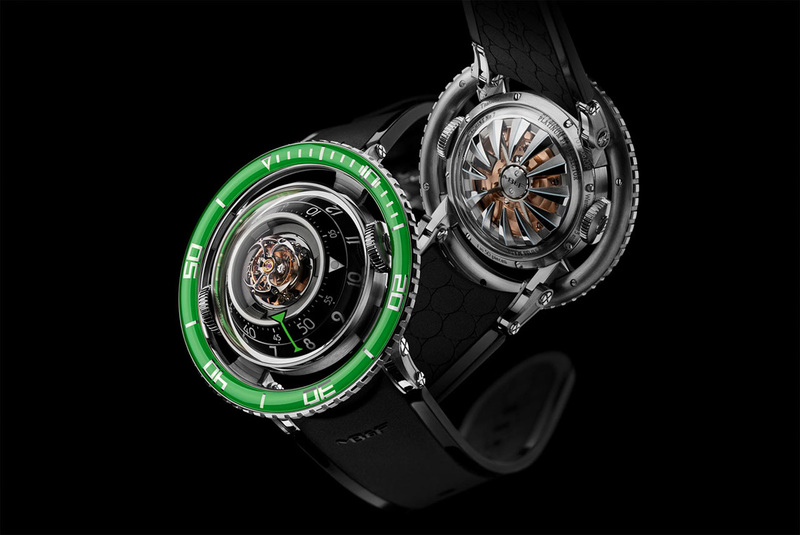 Beating at a frequency of 18,000 vibrations per hour (2.5 Hz) with a power reserve of 72 hours, the in-house developed 303-component HM7 Engine generates power from its tentacle-like automatic winding rotor crafted from a solid block of titanium with a platinum mass to ensure powerful and efficient winding. 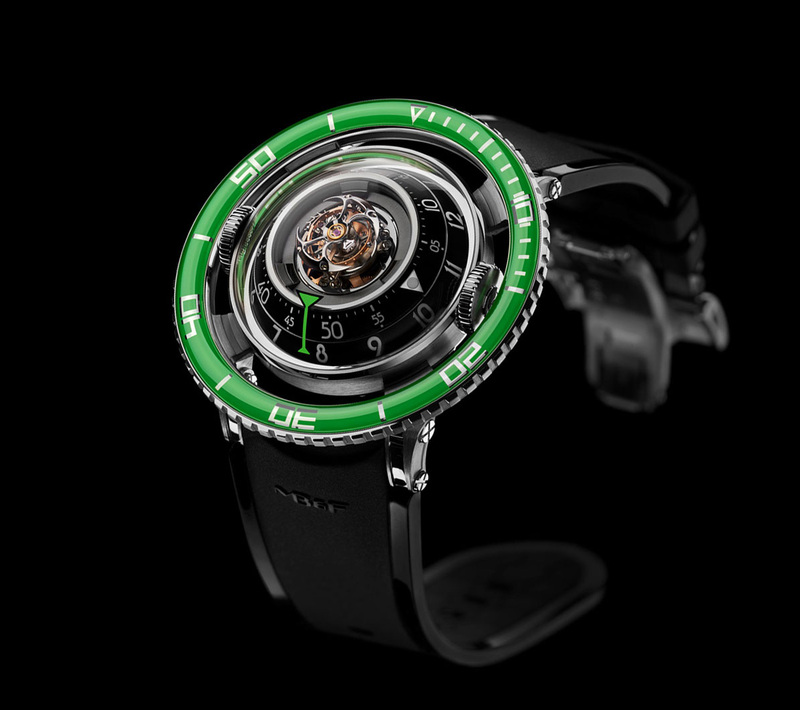 Limited to 50 pieces and completed by a rubber bracelet with folding buckle, the MB&F Horological Machine No.7 Aquapod Green has a price of Swiss Francs 108,000 / Euro 100,000 / US$ 108,000 before taxes. 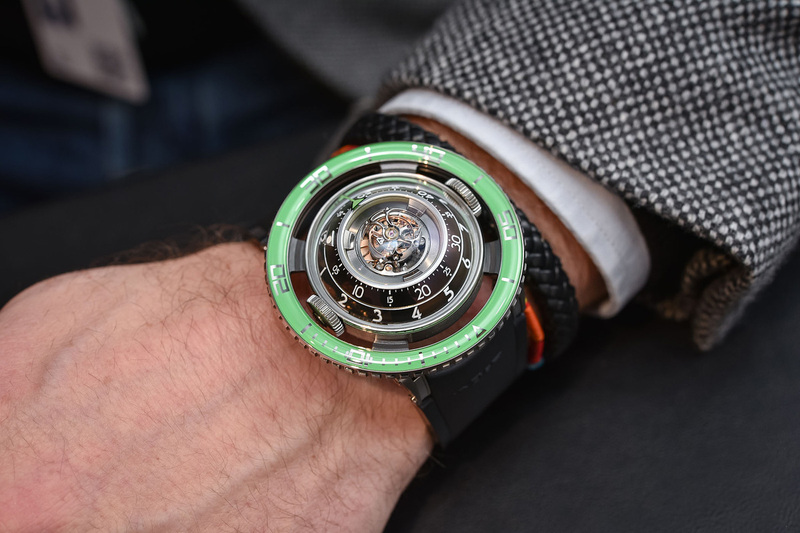 And don’t forget to check TOP 25 Luxury Watch Brands for Men.